We are inviting you along the 8 days tour following the historical character Vlad the Impaler. Yow will understand how the prince was transformed by Bram Stoker into a fabulous character in his Dracula novel. We will visit the main places and castles where Vlad reigned, as well as some of the places mentioned in the Bram Stoker's novel. Arrival at the international airport of Otopeni, meeting with the Guide and transfer to hotel. Panoramic tour on the way to he hotel. Walk tour of Bucharest, following the Dracula related objectives: the Old Princely Court ruins, the Old Court Church, the old city center, Revolution Square, a visit at “Dracula Bar” for understanding the historical and the legendary character. Breakfast buffet in the hotel. In the morning we have a panoramic tour of Brasov. Today we are focusing on the historical character “Vlad the Impaler”. We will track his steps in history for a better understanding his personality. There is no better place than the old Middle Age citadel of Sighisoara for this. Designated as a World Heritage Site by UNESCO, this perfectly intact 16th century gem with nine towers, cobbled streets, burgher houses and ornate churches. it also preserve the birth house of Vlad,Tepes. In Sighisoara we will visit the Clock Tower, the Weapons Museum and the Torture Museum, as well as other objectives which transformed Sighisoara in a world heritage. On the way to Sighisoara we will also visit Saschiz fortified church – another UNESCO world heritage objective. Dinner and overnight at the Cavaler Hotel 4* or similar/Sighisoara. Breakfast buffet in the hotel. This day is dedicated to the fictional character Dracula. We are heading Bistrita and the Bargo Pass – two important places mentioned in Bram Stoker’s novel. Bistrita is one of the oldest places in region, inhabited even in the Neolithic age. Saxons colonized the area in the early 13th centrury and transformed the city in one of the most important seven cities in the region (Siebenburgen). Bram Stocker chose it as the setting of his fictional Dracula’s castle. On the way we will also visit Targu Mures – the city of roses. Lunch in Bistrita. After lunch we are heading Bargo Pass (alt 1,200m) – a place with some of the most beautiful scenery in the Carpathians, with picturesque traditional villages located on hillsides. We will dinner and accommodate in “Castel Dracula” Hotel. This is the place which the fictional character Mina Harker described as “a lovely place, full of beauties”. We will also have a short walk nearby for feeling the “taste” of the local landscape. Dinner and overnight at the Castel Dracul Hotel 3* /Piatra Fantanele. Buffet Breakfast at the hotel. We are heading for Sibiu – one of the most important touristic cities in Romania, as it was selected to be the European Cultural City in 2007. On the way to Sibiu we will also visit Turda Salt Mine and the city of Alba Iulia. Lunch in Alba Iulia. Stroll through the bohemian Sibiu, you can see houses with their soiled facades, their ingots of iron that advertise vintage shops, their patinas oxide which stain red walls, the loose paving of streets, its windows of splays multicolored, ultimately everything in Sibiu, summarize the essence of the Middle Ages. We will visit the Great Square and the Small Square, the Orthodox Cathedral, the stairs passage, as the famous Liars’ Bridge. Dinner and overnight at the Ramada Hotel 4* or similar/Sibiu. Breakfast buffet in the hotel. 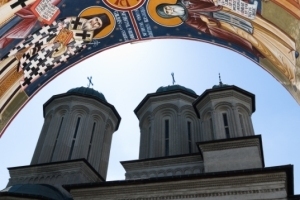 Before ending the tour in Bucharest, we have a full day for visiting two other objectives related to the historical character Vlad the Impaler – his Princely Court in Targoviste and Poienari fortress. From Sibiu we will cross the mountains in Wallachia on the “most beautiful road in the world – Transfagarasan”**. You will admire the beauty of the nature and one of the most impressive roads in the world*. We will stop at Balea Lake (alt. 2000m) and at Vidraru Dam, before visiting Poienari Fortress – built by Vlad’s rulers as a fortress used for hiding from enemies. Visitors need to climb a 1,462 steps stair to get to the old citadel, but the view from above worth every step. From Poienari we will visit the Princely Court of Targoviste – which served as the capital of Walachia, where Vlad ruled. It was here that the Prince impaled a great many disloyal local lords and noblemen after inviting them to a celebratory feast. “Chindiei” Watchtower now houses an exhibition illustrating Vlad’s life. From Targoviste we will return to Bucharest for a farewell dinner. 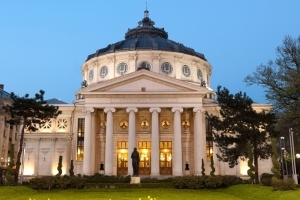 .Accommodation at the Hotel Double Tree by Hilton 4* or similar / Bucharest. **this route is available only from July to October, in the summer time. During the cold season, the route will follow the Olt River. Breakfast buffet in the hotel. Depending on the time of departure of the aircraft, have free time to get to know the city and doing last minute shopping. Transfer to the airport. End of the tour. For groups with more than 15 participants, the price will be calculated according with the number of participants. The tour is organized based on request, with minimum 1 month in advance.